Back in the 1980s and 1990s when I was a kid, I used to play with speed-glued rubbers like Donic Vario or Yasaka Mark V on 5-ply all-wood blades with various ayous/limba constructions like the Donic Waldner Allplay. When I returned to the sport in 2014, these types of blades were a natural starting point. Ayous/limba blades provide an unbelievable level of feedback and control, which is invaluable for developing and intermediate players. 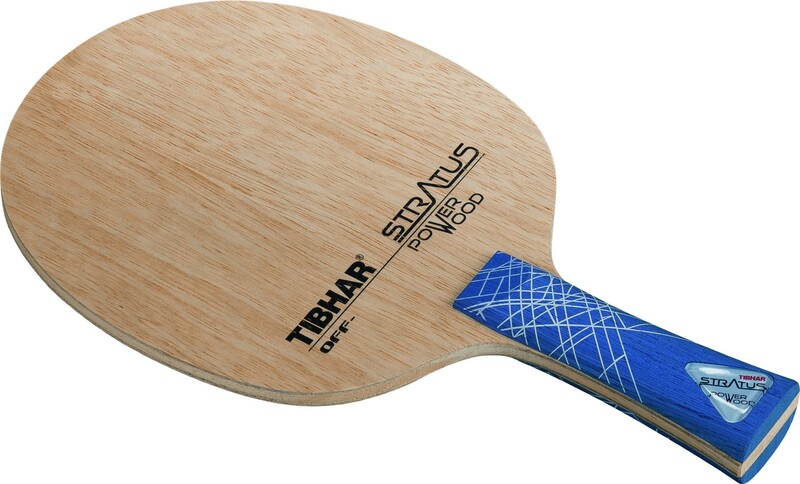 I was, therefore, excited to get my hands on Tabletennis11.com’s 7th best selling blade of 2016 and 2017, i.e., the Tibhar Stratus Power Wood, which has a thick ayous core, followed by a medium thick limba ply, and a thin limba outer ply. Tibhar describes the Stratus Power Wood as a 5-ply OFF- rated blade with unlimited flexibility that facilitates successful execution of the entire range of aggressive shots. Tibhar gives the blade a rating of “9” in speed and “7+” in control, listing it as being faster than its 7-ply cousin, i.e., the Samsonov Pro Force Black Edition blade, which is a recent favorite blade of mine (9-/7+). The blade comes in simple, yet functional and protective black box with red and silver text. The blade is slightly larger than average (158x152 mm) with a thickness of ~6.2 mm. My specimen weighed 85 g. The name of the blade is featured on the FH playing surface, whereas the back is without any text. The playing surfaces feel smooth. The handle has a blue-gray color with a white spider web design on the upper part of the handle and a large triangular lens on the bottom part of the handle. The dimensions of the FL handle are length ~102 mm, width 27-34 mm, and height 23-25 mm. The handle is smooth and feels rather bulky; players with smaller hands might find it a little big. The blade wings are sanded lightly for comfort. Overall, the build quality appears to be very good. A simple bounce test on the naked blade produced a fairly high pitch for an OFF- rated limba/ayous blade (1378 Hz), suggesting that the blade is relatively stiff and/or fast. Testing procedure: I sealed the blade with a thin layer of water-based varnish. I then attached well-used sheets of DHS Hurricane 3 Neo (2.15mm, black, National version, 40 degree hardness) and SpinLord Waran II (2.0mm, red) short pips on my FH and BH, respectively, using one layer of Revolution 3 normal viscosity glue. I tested the setup over 2-3 sessions, playing a mix of simple drills and practice matches using the DHS 3 Star D40+ plastic balls. Playing impressions: Having recently played with 7-ply blades such as the Tibhar Samsonov Force Pro Black Edition (SFPBE), the Tibhar Stratus Power Wood (SPW) felt more elastic right from the first shot, without being highly flexible though. Perhaps more than anything, it simply feels ‘thinner’ than the SFPBE. FH drives felt crisp, controlled, yet quite lively. I would characterize the SPW as being in the upper OFF- range. The blade’s thinner and more elastic nature became even more obvious on BH drives with the Waran II short pips, which felt faster and bouncier than with the SFPBE, and – especially – on FH loops. The longer dwell time of the SPW results in a slightly higher and longer arc along with greater spin production on loops. In fact, FH loops against heavy backspin are particularly easy to execute with this setup. Even though I used the only moderately fast DHS Hurricane 3 Neo as my FH rubber, the setup was sufficiently fast to allow for the execution of spinny FH loops from mid-distance. The SPW feels slightly slower than the SFPBE on shots involving greater physical effort, like FH loops from mid-to-long distance or FH power driver, although not by much. BH mini-loops and fishing shots from mid-distance using the Waran II short pips are playable but less controllable due to slightly bouncier nature of the setup, which led to the occasional stray shots. FH blocking felt more solid and comfortable than I expected for a 5-ply blade, as I had no difficulty in controlling loops from high-level players. BH blocks, on the other hand, felt bouncier and placed greater demands on precise timing than with 7-ply blades like the SFPBE. The differences are likely attributable to the different sponge hardnesses of the FH/BH rubbers. The elasticity of the blade, coupled with its OFF-level power, works well for flat hits and smashes, which results in more enough pace to outright win points. The SPW also works very well on drop shots and the short and service-return game, feeling only minimally livelier than the SFPBE in this aspect of the game. Backspin serves can be returned low, short and spinny right behind the net with excellent control. The SPW works very well with serves – short serves can be loaded with spin due to the increased dwell time, while fast and long serves benefit from the flexibility and OFF-level speed of the blade. In summary, the Tibhar Stratus Power Wood is a well-rounded, modern take on the classic 5-ply blade with ayous/limba veneer constructions. It is a little thicker, providing more speed and stiffness than traditional iterations of such blades, rendering it a better fit for the 40+ plastic ball. On the other hand, it is more flexible and slightly better suited for looping and spin generation than 7-ply blades with similar ply constructions. I enjoyed the feeling that the SPW provides in concert with the hard-sponged Hurricane 3 Neo rubber on the FH side, but longed for a stiffer, more glassy feeling with my BH short pips. Nonetheless, the Tibhar Stratus Power Wood is a great choice for intermediate and advanced players who are looking to upgrade from slower 5-ply blades, without jumping directly to 7-ply all-wood blades or composite blades. High-level two-winged loopers will also be able to enjoy this blade when combining the blade with fast medium-hard to hard modern rubbers. Lastly, it is worth pointing out that the Tibhar Stratus Power Wood offers a phenomenal price-performance ratio, which undoubtedly will continue to render this a very popular blade.